Originally posted: February 2, 2019 . Last modified: March 6, 2019 . A simple three ingredient breakfast your family is sure to love. 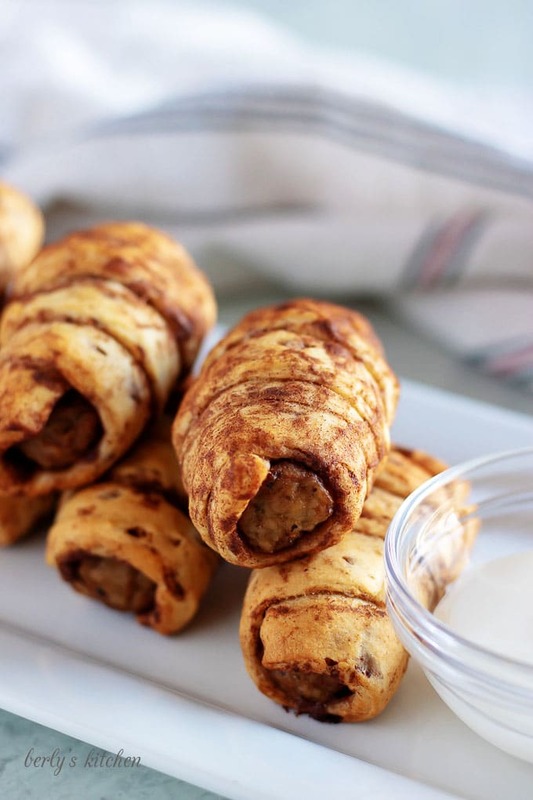 Cinnamon rolls and sausage combined to make a sweet and savory pigs in a blanket recipe. Before we get down to business, let’s take a moment to reflect on the name of this recipe. It’s something special, isn’t it? All joking aside, it’s a terrible name, we know. With being said, sometimes you have to play SEO game. After researching better keywords and names, we realized nobody has decided on what to call this breakfast dish. Without a popular name, your recipe won’t be found. 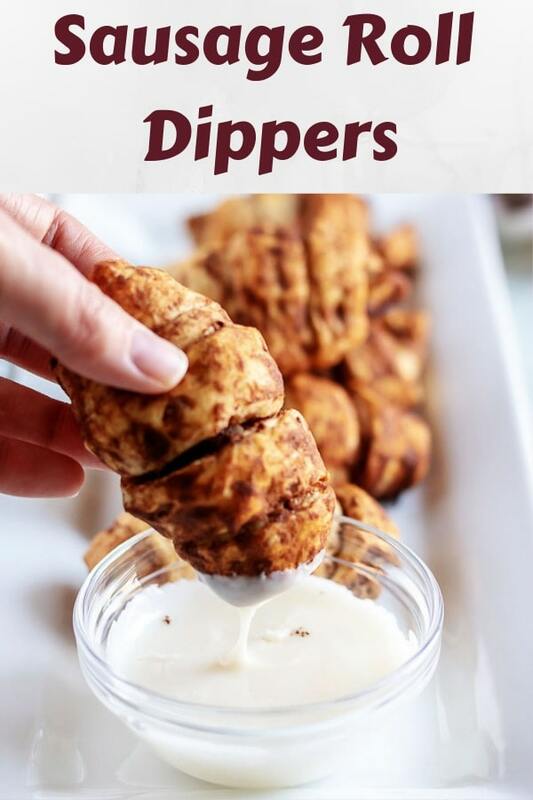 For that reason, and a few others, you’re stuck with cinnamon roll sausage pigs in a blanket recipe. It might be a mouthful, but at least it’s accurate. Alright, let’s move on and talk a little but about breakfast. What people eat in the morning is very subjective. For example, I enjoy muffins, while Kim would rather have a smoothie. As you can imagine, we have some epic debates about what to eat on a daily basis. However, we can usually come to some sort of consensus. This recipe was born from one of those compromises. One morning she was craving cinnamon rolls, but I wanted sausage and biscuits. 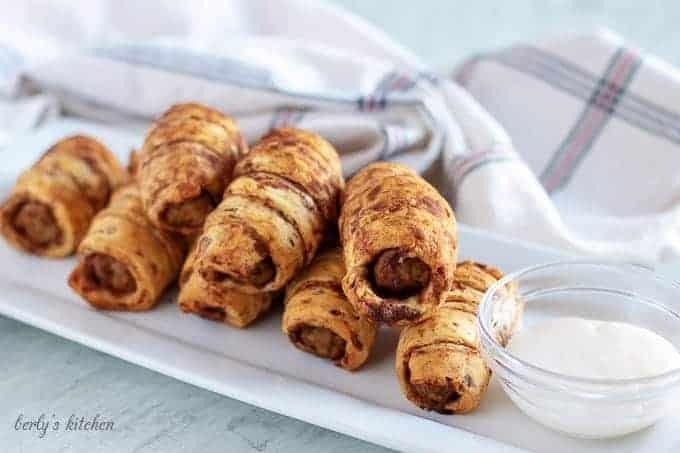 After going back and forth, we decided to combine the two and the cinnamon roll sausage pigs in a blanket recipe was born. She got the sweet pastry with icing and I got my savory breakfast sausage. Not bad, eh? Since you’re here, I assume you want something similar. Without further delay, how about we get started? Next, gently unwrap one of the cinnamon rolls and lay it cinnamon side up. After that, take a sausage and slowly wrap it in the cinnamon roll with the cinnamon side touching the meat. Kim described the wrapping process as, “stripes on a barber pole.” Start at one end of the link and work your way up wrapping the dough around as you go. You may have some meat hanging out on the ends, that’s okay, it’s not a big deal. Then, continue the wrapping process until all the rolls are gone. Just remember to leave an inch of space between each one. The extra space gives them room to rise without touching. Once of the pigs in a blanket are on the pan, you’re ready to bake them. Last, place the pan into the oven for 12-15 minutes, or until the cinnamon rolls have finished cooking. As long as you used pre-cooked sausage, everything should be done. 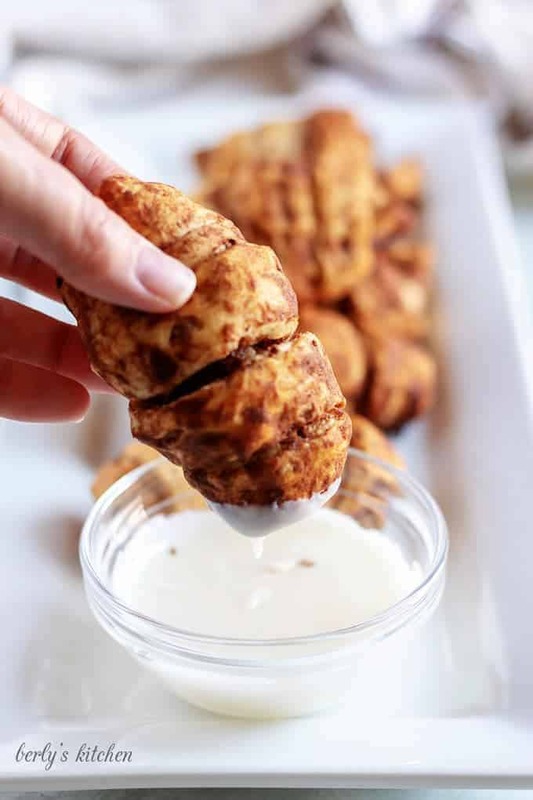 That’s it, your cinnamon roll and sausage pigs in a blanket recipe is complete. Serve them with warm icing and enjoy! If you want to add your own homemade spin to the recipe, consider making a cream cheese frosting. Simply combine, a half a block (1/2) of softened cream cheese, one (1) stick of softened butter, and two (2) cups of powdered sugar (and a few teaspoons of milk as needed for thickness). In case you were wondering, “Can you prepare pigs in a blanket in advance?” Yes, you can definitely make them in advance and you have two options for storage. First, they can be stored in a sealed container, in your fridge, overnight. The second option is to wrap them individually in freezer paper and place them into a freezer bag for up to thirty (30) days. At which point you can take them out and bake them as needed. Now, we haven’t frozen them ourselves, but given the recipe is made from processed ingredients, I see no reason why this shouldn’t work. Just as you can make your own frosting, you also have the option to prepare a homemade icing or glaze. All you need to do is combine powdered sugar, milk, and a dash of vanilla extract. I would recommend using one (1) tablespoon of milk for every cup of sugar. For a thinner glaze, add extra teaspoons of milk until you reach your desired consistency. 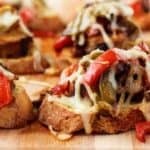 Looking for more breakfast recipes? Then check out some our all-time favorites! 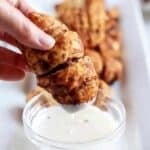 If you like this twist on a traditional pigs in a blanket recipe, please leave us a comment and rate the recipe card. You can also find us on Facebook, Pinterest, Twitter and Instagram searching for Berly’s Kitchen! Preheat the oven to 350°. Line a baking sheet with parchment paper or non-stick, silicone mat. Unroll a cinnamon roll, and wrap it around a sausage link, keeping the cinnamon pieces on the inside (wrap it similar to the stripes on a candy cane or barber pole). 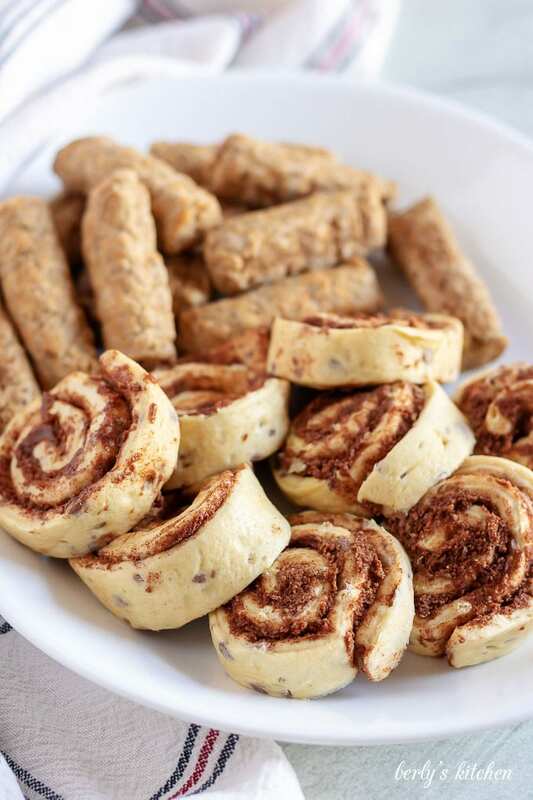 Place the wrapped sausage on the baking sheet, and repeat the process with the remaining cinnamon rolls leaving at least an inch of space between them. Place the baking sheet in the oven, and bake for 12-15 minutes or until the cinnamon rolls begin to brown. Remove the pan from the oven. Use the cream cheese frosting for dipping or drizzling. The calories listed are an approximation based on the ingredients and a serving size of two (2) rolls with about one (1) teaspoon of frosting. Actual calories will vary. The sausage rolls can be prepped in advance, stored in your fridge, and baked just before serving. Additionally, any leftovers can be stored in your fridge in a sealed container for up to three (3) days.